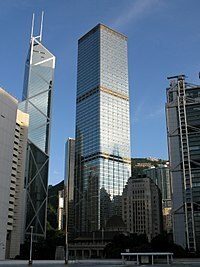 Cheung Kong Center (Chinese: 長江集團中心; Cantonese Yale: Chèuhnggōng Jaahptyùhn Jūngsām) is a skyscraper in Central, Hong Kong designed by Cesar Pelli. It is 68 storeys tall with height of 283 m (928 ft) and a gross floor area of 1,260,000-square-foot (117,100 m2). When completed in 1999, it was the third-tallest building in the city. It sits on the combined sites of the former Hong Kong Hilton, which was demolished in 1995/6, and Beaconsfield House, sold by the Government in 1996. It stands between the HSBC Hong Kong headquarters building and the Bank of China Tower. As is common in Hong Kong, coloured lights on the sides of the building illuminate at night in intricate light shows. The building is the headquarters of Cheung Kong (Holdings) Limited ("CKH"), and is owned and managed by its 49%-owned associated company Hutchison Whampoa Limited ("HWL"), while other tenants include several multinational banking firms. The 26-storey Hilton Hotel building and its site, Inland Lot 7702, was owned by a wholly owned subsidiary of HWL, which licensed Hilton Hotels Group to operate it for 50 years. In January 1994, with about 20 years of the management contract to run, HWL announced the buyout of the unexpired term for US$125 million. HWL had originally planned to redevelop the Hilton site into a high-rise office-retail complex, yielding a gross floor area of 584,970-square-foot (54,300 m2). HWL was keen to enlarge the redevelopment project by merging the hotel site with a neighbouring site to gain a greater efficiency, and commenced private talks with the Government in May 1993 with a view to acquiring the adjacent 33,700-square-foot (3,100 m2) car park site, and the 18,300-square-foot (1,700 m2) Beaconsfield House site from the Government. Talks were finalised in August 1995. The Executive Council approved in principle the sale of the sites in April 1995. In September 1995, the Urban Planning Committee of the Town Planning Board passed the proposals for the 9,900 m² combined site. With a plot ratio of 15, 1,600,000 sq ft (150,000 m2) building (including the 1000-space car park) could be built. The developer agreed with the planners that most of the building would actually be weighted on the Hilton site, so much of the car park and Beaconsfield house area would be given over to park and public amenities. On 28 May 1996, Director of Lands Bob Pope disclosed that the land premium for developing the combined site was HK$3.02bn (South China Morning Post, 29 May 1996). The 1996 annual report of HWL reflects the new lease of Inland Lot 8887, with a site area of approximately 103,937 sq ft. The gross floor area of the building is recorded as 1,254,158 sq ft in the 2002 annual report and 1,263,363 sq ft in the 2003 and subsequent annual reports. The building was designed by architects Cesar Pelli and Leo A. Daly, and is considered as much a work of art as an efficient working environment. Its large floor plates range from 20,000 sq ft (1,900 m2) to 22,000 sq ft (2,000 m2). Tenants can customise an entire office plan at very little expense, as there are no obstructing columns on the floor plan. Offices are all designed with the advanced raised floor system through which air-conditioning and an advanced fibre-optic network accessible to all tenants is ducted. It boasts the region's fastest elevators, made by Mitsubishi, maxing out at 9 metres per second. Each elevator features giant plasma displays at the top of each cabin, showing Bloomberg TV. The top floor is used by the Chairman of CKH and HWL, Li Ka Shing, as his office. It also contains a private swimming pool and garden. Li is often seen escorted and takes a freight elevator operated in attendant mode so that it does not stop on any other floor. Other tenants of the building include Allianz, Bank of America Merrill Lynch, Barclays Capital, BlackRock, Bloomberg, Goldman Sachs, Jefferies, McKinsey & Co., PricewaterhouseCoopers, Royal Bank of Canada, RBS, Och-Ziff Capital Management and the Securities and Futures Commission. Goldman Sachs (Asia) is reported to have signed a 12-year lease on eight-and-a-half office floors, becoming the leading tenant. Hutchison is believed to have offered up to two-and-a-half years rent-free period. ^ a b c d "Cheung Kong Centre - The Skyscraper Center". Council on Tall Buildings and Urban Habitat. Archived from the original on 18 October 2013. Wikimedia Commons has media related to Cheung Kong Center. This page was last edited on 21 November 2018, at 04:29 (UTC).